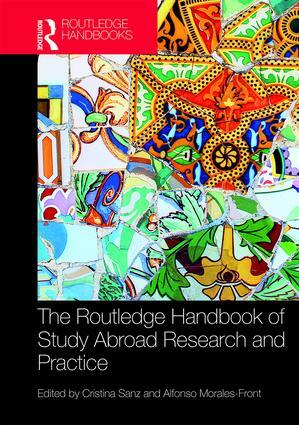 The Routledge Handbook of Study Abroad Research and Practice is an authoritative overview of study abroad and immersive context research specifically situated within applied linguistics and Second Language Acquisition (SLA) for graduate students and researchers in these fields. Featuring contributions from established scholars from around the world, this volume provides in-depth coverage of the theoretical approaches and methodologies used in study abroad and applied linguistics research, and examines their practical implications on program implementation. The Handbook is organized around core areas of research and practice: language development and personal growth; study abroad settings; individual differences of learners; and applications concerning the preparation of students, teachers, and administrators for study abroad, the role of study abroad in foreign language curricula, and future directions. This handbook is the ideal resource for graduate students, researchers, and administrators interested in learning more about linguistic and personal development during study abroad. "This authoritative volume exemplifies the contemporary state of the art in research on language learning in study abroad contexts, representing a broad range of theoretical frameworks and methodological approaches. It should be required reading for researchers in this field as well as for language education professionals involved in international education." 2. Psycholinguistic, cognitive and usage-based approaches to study abroad research. 6. L2 Spanish intonation in a short-term study abroad program. 7. Being polite at the railway or bus station: How role-play can illustrate the differences between Study Abroad groups vs Heritage Students and At-Home groups of Spanish L2 university learners. 8. Developing L2 pragmatic competence in study abroad contexts. 9. The development of second language grammar in a study abroad context. 21. Making a difference through talk: Spanish heritage speakers as language exchange partners in a hybrid study abroad program. 22. Curricula crossing borders: Integrating multicultural and multilingual teacher education courses in study abroad. Eric Bybee, Julia Menard Warwick, Enrique David Degollado, Deb Palmer, Shannon Kehoe, Luis Urrieta Jr.
23. Development of critical intercultural communicative competence and employability in work abroad programs: A UK perspective. 24. Interaction and corrective feedback in study abroad. 26. The role of cognitive aptitudes in a study abroad language learning environment. 29. Proficiency levels in study abroad: Is there an optimal time for sojourning? 30. What do we (not) know about the effects of age on L2 development when learning occurs in a study abroad setting? 32. The role of individual factors in students’ attitudes toward credit-bearing pre-departure classes: implications for practice. 35. History and current trends in U.S. study abroad. Cristina Sanz is Professor of Spanish Linguistics, Chair of the Department of Spanish and Portuguese and Director of the Barcelona Summer Program at Georgetown University. Alfonso Morales-Front is Associate Professor of Spanish Linguistics and Director of the Spanish Summer Institute and the Quito Summer Program at Georgetown University. Routledge Handbooks in Applied Linguistics provide comprehensive overviews of the key topics in applied linguistics. All entries for the handbooks are specially commissioned and written by leading scholars in the field. Clear, accessible and carefully edited Routledge Handbooks in Applied Linguistics are the ideal resource for both advanced undergraduates and postgraduate students.